Clinical psychologist Chris Mackey discusses some tips for ageing well. Ageing well physically and ageing well mentally go hand in hand. 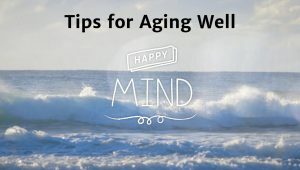 Many activities that are beneficial for the way we age physically, such as physical exercise, are also beneficial for the way we age mentally. This clip was taken from series 2, episode 11 of Destination Happiness.